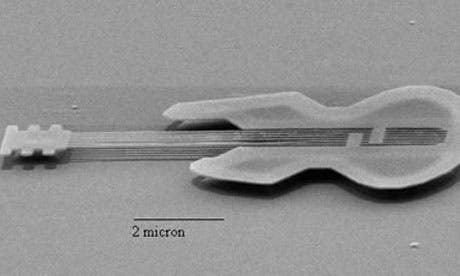 The world’s smallest functional guitar is only 10 micrometers long, about as big as a single blood cell, for example, with each string measuring about 50 nanometers, or 100 atoms, wide. Made by researchers from the Cornell University from crystalline silicon, and even if somehow we could play it, with an atomic force microscope for example, it would vibrate at frequencies inaudible for the human ear. Using high-voltage electron beam lithography at the Cornell Nanofabrication Facility, one of only two similar machines in this country, the structures were practically sculpted out of a single silicone crystal on oxide substrates. Nanotechnology miniaturizes normal objects but in this case, researchers seem to have outdone themselves. As I said earlier, the guitar measures only 50 nanometers, while a human hair, for example, measures 10,000 nanometers. Now, get ready to hear a real kicker: the guitar was built in 1997! Since the, the team has gone forward and built much smaller things, which benefit science and medicine.